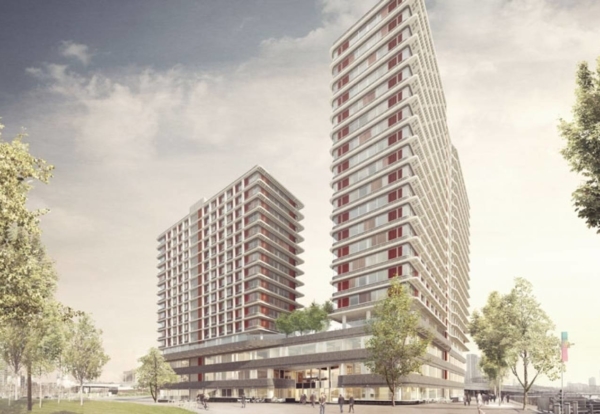 University College London has picked Vinci Construction as preferred contractor to deliver two high-rise student blocks for a planned new campus at the Queen Elizabeth Olympic Park in East London. The Pool Street West student accommodation project makes up part of the first phase of UCL East, the largest single expansion of UCL since its foundation. Vinci is understood to have beaten Bouygues and ISG in the bid race. The 500-room project, designed by architect Lifschutz Davidson Sandilands, will rise to 16 and 20 floors, including a three storey podium, to house the Future Living Institute: a multi-disciplinary home for research, innovation and teaching. Construction of Phase 1 of UCL East will start this year, and will consist of over 50,000 sq m of development across two buildings. Mace secured the other major building, known as Marshgate 1, last year.